Experience Sydney's undiscovered Chinatown in the heart of Kingsford on Saturday 16 November 2019 from 12pm to 9pm. For one day only, watch Meeks Street come to life and transform into a lantern garden and bustling hawker-style food market. The markets will offer a taste of the best that Kingsford has to offer. Local restaurants will take a stall and cook their signature dishes with fresh produce, right in front of you. Be tantalized by the authentic aromas and flavours on offer, including Indonesian, Japanese, Chinese, Malaysian, Vietnamese and more! There will be plenty of live entertainment and activities for all to enjoy, including lion dancers and cultural performances. Car parking is available for free at UNSW - access via Barker Street, Gate 14. This is just a short stroll to the event via Harbourne Street. This event is proudly brought to you by Randwick City Council in collaboration with the Kingsford Chamber of Commerce. 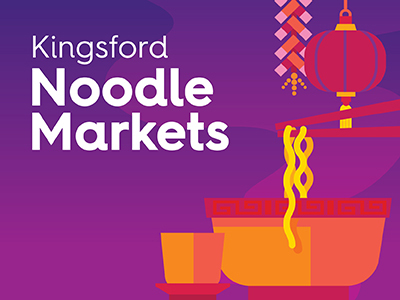 Take a look at the highlights from the 2017 Kingsford Noodle Markets!